The Next update won't silence all the critics, however. 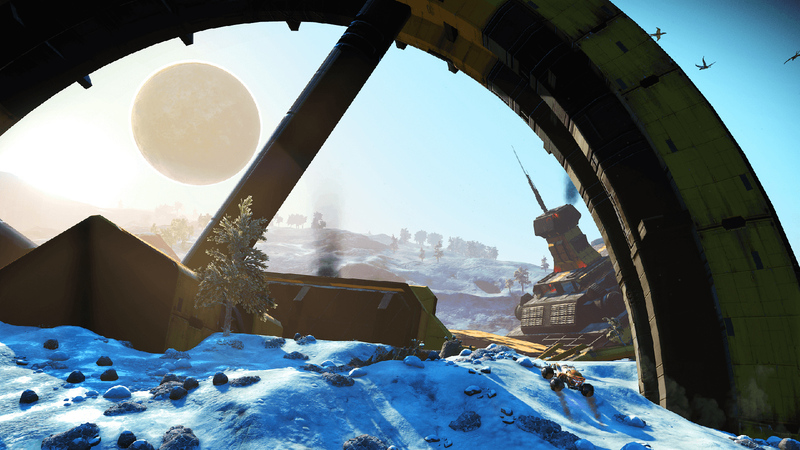 The huge No Man's Sky Next update has landed. Now we've had some time to relax into new material economies, multiplayer adventures and horrific alien eggs that will ruin your day, do we feel differently about the contentious space exploration game that promised so much and didn't quite deliver? The Engadget team outline how their odyssey is faring this time around. No Man's Sky is an excellent chill-out game. I can easily spend an entire evening just walking around and mining resources with a good playlist or podcast in the background. I do, however, have a problem with the game's overly ambiguous crafting, trading and upgrade systems. I often spend as much time, if not more, with my laptop and a fan-written guide open. To craft one item, I usually need two other items, each of which requires three minerals to make. With limited inventory slots (at least at the start of the game), this item rabbit hole quickly gnaws at my zen-like state. The recent Next update improves the experience, slightly. I was overjoyed, for instance, to step into a space station and find a terminal offering an extra inventory slot. The new base system, which lets you build a home (almost) anywhere, is a nice distraction from the mineral-gathering grind. I also appreciate the tagging tool that makes it easier to track and find points of interest. And, of course, the updated visuals -- including the all-new third-person view -- make wandering and pillaging even more relaxing. The core crafting, though, is still convoluted. I was disappointed to land on a planet, locate a drop pod and discover that it needed three advanced items to repair. Pre-patch, they merely required credits to unlock. I spent the next few hours googling the appropriate materials and powering my portable refiner. A few hours later, I jumped into my ship and headed for the nearest space station, hoping to sell some materials and free up a few vital inventory slots. I then went back to the planet, only to discover that it was nearly impossible to find my partially-repaired drop pod again. Frustrated, I saved my adventure and went to bed. The Next update, unquestionably, makes No Man's Sky a better game. The procedurally generated universe, though, still has its quirks. I know that many people adore the game's complicated systems and the feeling you get from finally unlocking a new multi-tool upgrade. There's a pleasure, too, from finding the most efficient way to mine a particular item or mineral. Sometimes, though, I wish everything was a tad simpler. If the game had more intuitive hints, like -- 'you can find this plant in caverns,' or 'you'll need the portable refiner for this' -- I could spend more time zenning out and fewer hours trawling forums. After years of anticipation, I ended up playing only 10 hours of No Man's Sky when it launched. I enjoyed its meditative take on space exploration -- explore, find planets, get resources, repeat -- but there simply wasn't much there to keep me hooked. And yes, I was disappointed. I spent way too much on the "Explorer's Edition" that came with a die-cast spaceship. It's hard not to feel a pang of regret every time I see it on my bookshelf, still in its dusty, unopened box. I drifted away from No Man's Sky with the intention of returning once Hello Games fleshed things out a bit, and the Next update is exactly what I was waiting for. It adds enough new features, like a third-person view, base building and multiplayer, while also polishing the entire experience. 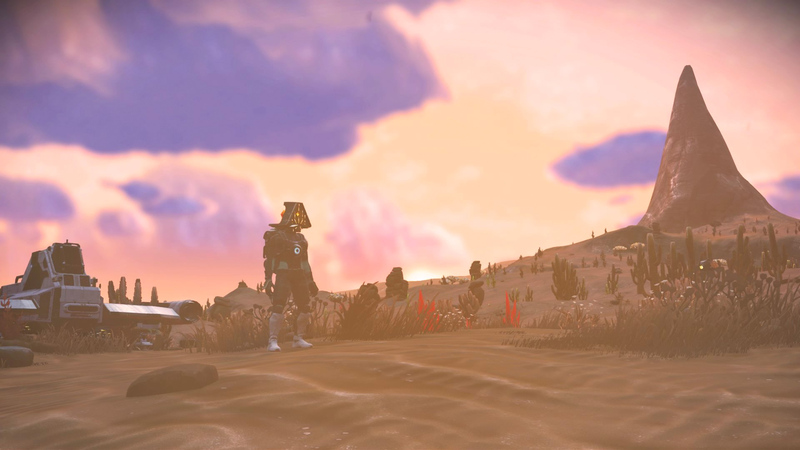 Finally, No Man's Sky doesn't feel like an over-hyped early access game. I've spent around six hours with NMSN on PC, mostly exploring the gorgeous, semi-toxic planet where I started out. It was better than the frigid ice planet I initially loaded up. From the get-go, I enjoyed actually seeing my character with the new third-person camera (you can quickly jump back into first-person mode through the settings). It makes me feel like I'm actually inhabiting these far-off planets. I'm looking forward to designing what my character looks like, once I find a space station. It took me a while to get a hang of the revised crafting system, which now includes portable refiners for pumping out more complex ingredients. But thankfully, No Man's Sky is much clearer about what you need to do now. It helpfully guided me towards the ingredients I needed to fix my broken spaceship at the beginning of the game, and afterward, it helpfully pointed me to start building a base. I'm starting out with a shack nestled between cliffs and toxic plants on my home planet, but I'm intrigued by the added flexibility with this update. Now you can make bases as big as you want, wherever you want -- even underwater, or on the sides of cliffs. Unfortunately, everyone I know is playing No Man's Sky on the PS4 or Xbox, so I won't be able to play with them on the PC. Time to make some new space-faring friends, I guess. I'd love to see Hello Games make cross-platform multiplayer a reality, but that would require even more development time on a game they're probably sick of already. Perhaps instead of making a direct sequel, the developer would be better off treating it like an MMO, creating features to entice new players, while adding some paid content. I appreciate all of the free updates, but I wouldn't blame Hello Games for trying to make the title even more sustainable. No Man's Sky was always a game about potential -- the potential to start from the ocean and launch into space, not knowing what you'd find. It was undoubtedly ahead of its time, but the hype tapped into our desire for the next stage in open-world games. Even without calling it such, gamers instinctively saw it as our first open-universe game. It's still not there, but Next at least brings us one step closer to that dream. It's a better-looking game. I'm not sure if the upgrade involved tweaking the game's procedural generation magic, but the planets are prettier inside and out. Even if they're not any friendlier. I'm another NMS restarter and had to create a new game. I found myself crashed on a very inhospitable planet that was taxing my hazmat meter immediately. It meant I had to relearn how to scan and find minerals... fast. The update has swapped out some mineral names for others, so you do need to reacquaint yourself with crucial resources and what they're used for. Recipes for fueling key parts of your ship, like the launch thrusters and pulse jump, are also different. Any renaming frustrations soon evaporated, and I found myself appreciative of all the other evolved mechanics in the Next update, like the shortcuts to swiftly recharge health, weapons or protective suit. It means far less menu churn and helps keep your eyes on the planet, not your inventory. But back to my first planet. While exploring, I fell down into a cave filled with plants, minerals and treasures. Which was great, until the plants turned hostile and began spitting poison everywhere. I rushed deeper into the cave. I never came back out. No Man's Sky's subterrain is still very easy to get lost in, and I simply ran out of life support. It was not a heroic death. Once resurrected, I cautiously put together what I needed to get the hell away from the planet, with a toxic atmosphere biting at my heels. I assumed this was what everyone was dealing with on their first planet, but after asking others, I realized this was merely my game -- my journey. My journey improved. The second planet not only had a great haul of Albumen pearls (a decent money maker) but also a new, bigger ship. Sure, it was a fixer-upper, but it added yet another distraction. There are countless ways to get the resources you need to build technology, and scanning animals and flora now yields useful nanites that can help bolster your space suit and your ship. While I interacted with a few strangers and PSN friends, I still found the game a little lonely. My buddies were spread across different platforms, while time-zone differences and a heatwave in the UK all reduced my chances and time playing with my fellow colleagues so far. It can also still get boring. Drilling away for more ferrite and copper, throw it into your refiner. Repeat. It feels like a job. Fortunately, the update name is apt: Next. What was I going to do next? Build my base? Trade my way to riches? Follow the path of Atlas? The right answer for me was a little bit of everything. I only played No Man's Sky twice on PlayStation 4. The grind and the incessant inventory management got to me early. With this update, though, I'm finding myself drawn back, thanks to the new creative mode. I don't have to scour for buried artifacts, so I can build a warp drive and leave the starter solar system; I just need to craft one from the unlimited resources at my disposal. For a game that's laser-focused on exploration, being freed from these shackles makes the experience immediately more fun. As my buddy Victor put it, with creative mode, it's all about discovery. There's no nagging fear that you can only launch off a given planet two more times because you don't have the resources needed to launch your ship and get into orbit (or light speed), and that you just wasted one by landing on an arid wasteland. Victor and I started playing the standard mode last week, but quickly realized our folly. Now, we play in creative and make our own fun. To keep us from just skipping around without ever doing anything, we've set up a few base rules: Once we get to a new solar system, we have to explore at least two celestial bodies, and we have to name at least one animal and one piece of flora on each. Think of it like a game of I Spy that keeps us from warping directly to the algorithmic galaxy's center. I have a normal mode save file for when I just want to chill out solo for a night and scan whatever comes into my view, but if I just want to shoot the breeze online with buddies, creative is the default.